Batch converter that allows you to convert DWG and DXF files to TIF (TIFF), JPG (JPEG), BMP, GIF, PNG, TGA, PCX, WMF and EMF without the need of AutoCAD. - Stand-alone utility - AutoCAD NOT required. 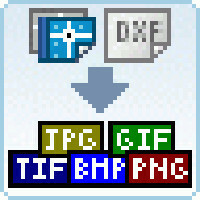 - Convert DWG and DXF to Image in batches. - Supports paper space and model space.